NICE has published guidance recommending the use of ibrutinib as an option for treating chronic lymphocytic leukaemia (CLL) in adults who have had at least one prior therapy, or who have a 17p deletion or TP53 mutation and in whom chemo-immunotherapy is unsuitable. The NICE guidance stipulates that ibrutinib must be provided with the discount agreed in the patient access scheme. 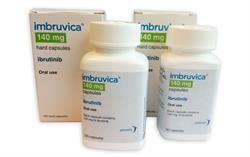 Ibrutinib (Imbruvica) is a protein kinase inhibitor also indicated for use as monotherapy in the treatment of adults with relapsed or refractory mantle cell lymphoma and the treatment of Waldenström's macroglobulinaemia in adults who have received at least one prior therapy, or as first-line therapy in those unsuitable for chemo-immunotherapy. The drug is also licensed for use alone or in combination with bendamustine and rituximab for the treatment of CLL in adults who have received at least one prior therapy.